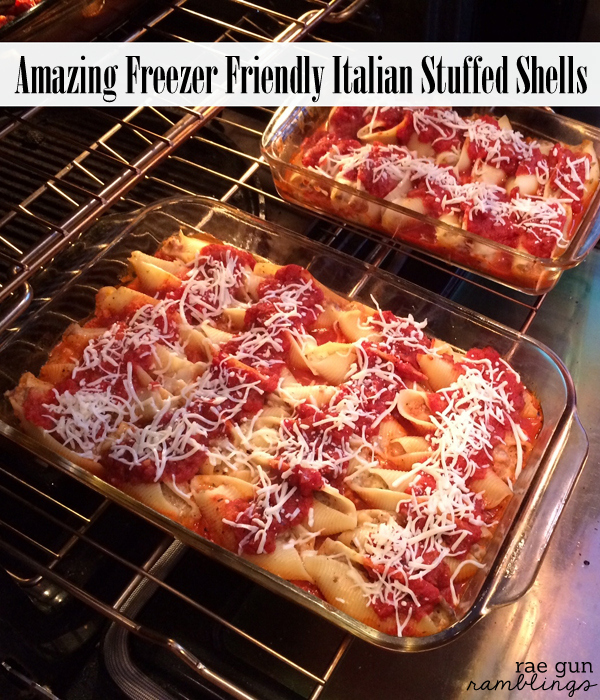 I have loved this freezer friendly Italian stuffed shells recipe for years. The only thing is that it does take some energy and is messy so when I do it I usually save it for a special occasion and/or multiply it so I have a freezer full. This is actually one of my favorite recipes to me it’s special but compared to other special foods it’s actually not too hard to make. In fact we had it for Christmas this year. I made a triple batch so that I could freeze a few trays for after Toasty is here. I have high hopes of making freezer white chili, creamy enchiladas, and shepherd’s pie too before this boy breaks free. 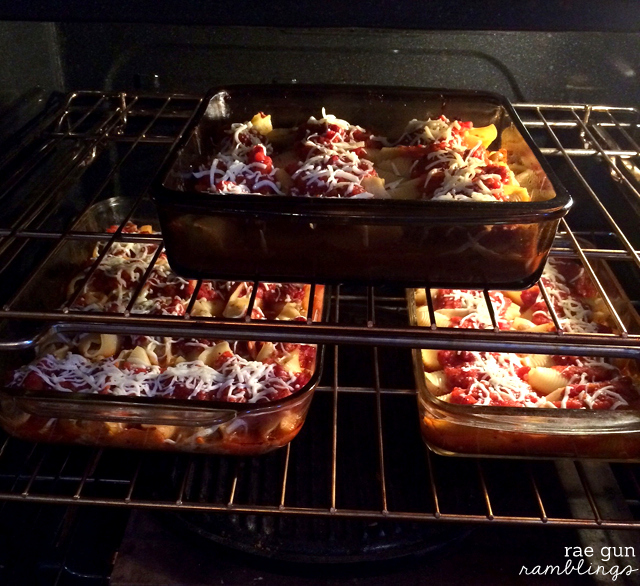 This recipe makes about 30 large stuffed shells. If you have it with some garlic bread and a salad a serving of 4-5 per adult would be a pretty filling meal. I like to cook extra shells since there always are a handful of shells that stick or break apart when cooking. Make sauce by sauteing onions and garlic in butter. Add tomatoes, wine, and herbs. Simmer for 15 minutes. In a separate pan (I like to use a wok) make the pasta filling. Start by browning the sausage with wine. Remove cooked sausage when wine is mostly cooked down and set aside. If there is a lot of grease drain all but 4 TBS (if there is not that much left use butter). Add 4 TBS of flour to the oil to make a roux. Slowly stir in milk to create a cream sauce. Remove from heat and allow to cool for 10 minutes and add sausage back in. Stir in cheese (reserving some to and add any desired seasoning to taste (ex. onion powder, pepper flakes, herbs, salt and pepper). Stir in egg (you want to the mixture to be warm but not hot enough to cook scramble the egg). Boil the pasta and then run it under cold water to stop the cooking. Put a thin layer of sauce on the bottom of the pan. 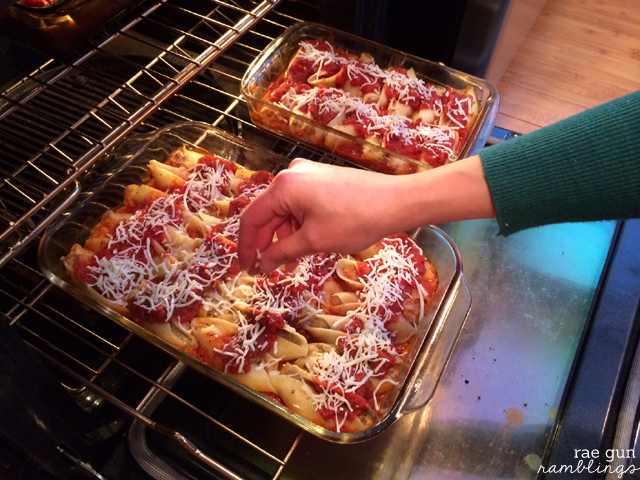 Fill the shells and layer in the pan. Top with more sauce and a sprinkling of reserved cheese. If you want to freeze it do so before baking. You can bake it from frozen which will probably take extra time (30-60 minutes more) or if you think ahead thaw it in the the refrigerator and bake like normal. Nothing besides the egg needs to be cooked so you just want to make sure it’s nice and hot inside. Enjoy! Would it be possible to make this recipe on a camp stove? It looks so delicious! Yum! I love meals that you can make a big batch of and freeze for the future! Once Toasty is here you’ll be so glad to have meals stocked up, ready to go! Wow! This looks so good. I think I’m hungry. 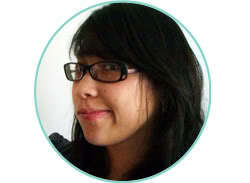 Thanks so much for sharing it with us. These look delicious! And anything that is freezer friendly is a plus in my book! Okay so what time is dinner? (LOL!) But really, this looks amazing and I am an Italian cuisine junkie, love it, can’t get enough of it! I will have to try your recipe and let you know how it turns out. Happy Eating! Also, you mention that you can add 1/2 a cup of wine to the sauce and filling, yet it never mentions when to add the wine to the filling. When I added the wine, it became extremely runny and ruined the dish. It does not look good. Would you suggest adding tomato sauce or paste? 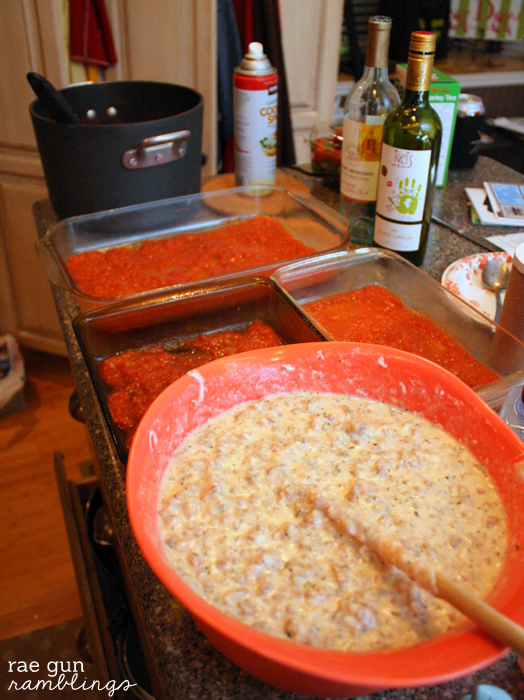 The tomatos added a runny liquid to an already runny recipe and I don’t think the “sauce” will have much tomato flavor. That just means you don’t have to thaw the dish if you decide to freeze it you can just stick it in the oven for longer. If you want to use the wine in I add it while I’m cooking the sausage so most of it will cook down. I’m not sure why yours came out so watery mine is actually not very watery. You might try cooking it down more if you don’t like the consistency of the sauce before assembling. Although you do want some liquid or it your noodles will be dry. I like it how it is and I’ve feed it to lots of people made this way, but by all means if you want to switch things up you can try tomato sauce or tomato paste.